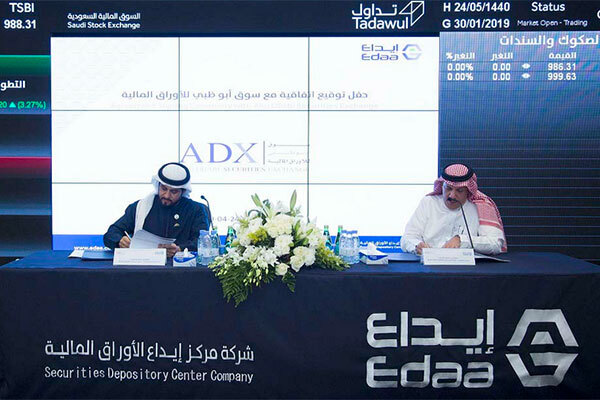 Abu Dhabi Securities Exchange (ADX) recently signed an agreement with the Securities Depository Centre Company (EDAA), which is wholly-owned by the Saudi Stock Exchange (Tadawul) and the sole entity responsible for providing custody, registration, clearing and settlement services for securities traded on the Saudi Stock Exchange. The memorandum of understanding (MoU) was signed in the Saudi capital Riyadh with the aim to strengthen bilateral cooperation in the dual listing of securities in Saudi and UAE financial markets, reported Emirates news agency Wam. Commenting on the signing of the agreement, Al Mansouri reaffirmed ADX's keenness to develop its legal and legislative structure in accordance with the best international standards to ensure a competitive, transparent and fair trading environment. He said: "The MoU with EDAA will enhance the Exchange’s efficiency in the governance of dual listing operations, which in turn will increase the Exchange’s attractiveness to foreign investors, enhance liquidity and boost investor trading." Al Mansouri added, "This agreement reiterates the strong relationship that ADX enjoys with Tadawul and other organisations in Saudi Arabia. We continuously seek to bolster these partnerships through cooperation agreements and the standardisation of frameworks in various aspects of ADX operations, such as corporate governance, listing requirements, disclosure, and trading rules. The agreement between the Abu Dhabi Securities Exchange and EDAA will enable each party to open a deposit account with the other party to deposit and transfer securities in accordance with their procedures. In addition, it will enable holding and maintaining securities ownership registers of the deposited securities within each party and managing them , as well as effective exchange of information, data and records related to the ownership registers or the transactions executed or to be executed by brokers, members or clients or any information and data that both parties deem necessary.